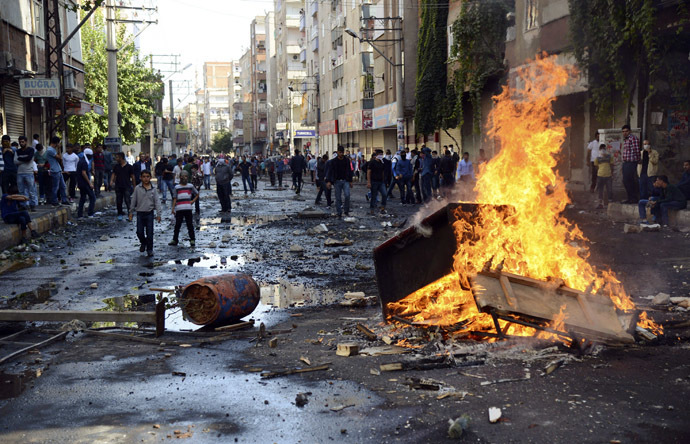 According to the local Hurriyet newspaper, tensions spilled over in Ankara when AKP’s deputy speaker Sadık Yakut began, seemingly on purpose, to mispronounce the name of Adil Zozani, a member of the Kurdish-dominated Peoples’ Democratic Party (HDP). Kurds say they will be the main casualties of the reform, which has been introduced ostensibly in response to violent pro-Kurdish protests last October. 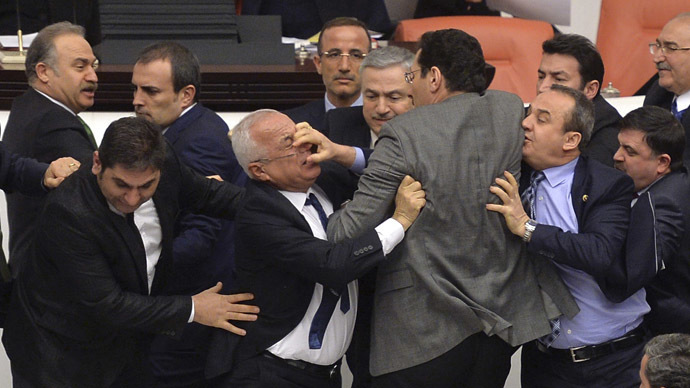 One of the AKP deputies then bull-rushed a member of the CHP, enraging the entire group, who threw punches, and tried to separate and protect their own party members. One CHP deputy was injured after falling down an internal staircase, but refused to leave the scene of the brawl to be attended to by a doctor, loudly vowing to “continue the fight. The entire incident lasted around 10 minutes. Unlike the previous scuffle between the same parties on Tuesday, in which five people were injured after a ceremonial gavel and a chair were wielded as offensive weapons, no props came to hand in Thursday’s mass brawl. The proposed legislation expands police powers, while reducing the need for judicial approval of a whole host of actions against protesters. If passed, potential dissenters could have their homes searched by the police without an order, and be detained for up to 48 hours without a court decision, at the behest of a regional governor. Opposition activists say this will allow the ruling politicians to sabotage any political protests by ordering arrests of key leaders. During any actual demonstration, police would be entitled to fire live weapons against demonstrators, while anyone in the crowd wearing a mask, a common tactic to avoid criminal charges, could face up to four years in jail. 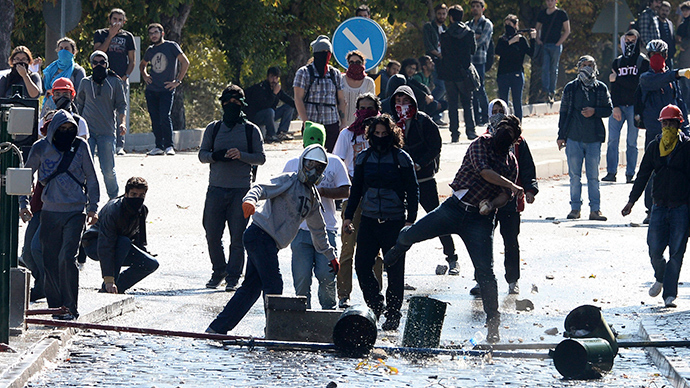 Critics of the regime say this is not just a means of cracking down on the restive Kurdish regions, but a means of stifling political dissent similar to the massive 2013 Gezi Park and Taksim Square protests. The government-driven bill has been notably criticized by outside organizations, such as Reporters without Borders, who said that it would be used against independent journalists, and by former President Abdullah Gul, who said the measure would threaten “checks and balances” within the Turkish political system. Although opposition parties have no means of challenging the AKP majority in parliament, they have promised to resort to filibusters to delay the passing of the reform.